Annual epidemics of influenza occur between late fall and early spring and may be caused by 2 strains: either influenza A (with varying subtypes) or B. 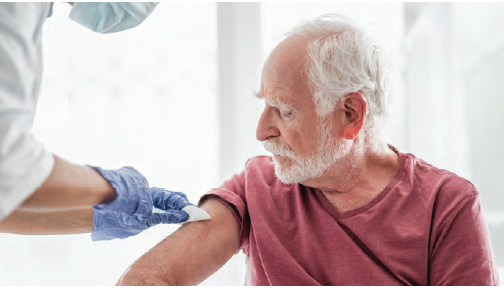 To control and prevent influenza, a routine annual vaccine is recommended for all those >6 months who do not have contraindictions.7 In years that the influenza vaccine is discordant with the circulating strains of influenza, multiple benefits have been observed. These benefits include reduced severity of influenza-associated illness7; a decrease in influenza-associated hospitalizations, including admission into the intensive care unit8; reduced complications of other health conditions, such as cardiac disease and diabetes9,10; and reduced mortality.8 For these reasons, annual influenza vaccines are recommended, even during years that the strains in the vaccine do not match the circulating ones. For the 2018-2019 influenza season, the influenza activity was too low at press time to determine if this year’s vaccine will closely match the circulating strains. As of November, influenza A(H1N1) was the most common circulating strain. However, both influenza A(H3N2) and influenza B are circulating in lower numbers. If this trend of circulating viruses continues, this year’s vaccination should be protective. Although full results of another trial, CAPSTONE-2 have yet to be published, patients with a high risk of complications because of influenza had similar trends with a reduced time to improvement of symptoms compared with the placebo (73.2 vs 102.3 hours, respectively; P <.0001) and oseltamivir (73.2 vs 81.0 hours, respectively; P = .8347). Additionally, median viral shedding was reduced in those who received baloxavir marboxil compared with oseltamivir or a placebo (48 vs 96 and 96, respectively; P <.0001).13 The clinical relevance in these differences has yet to be studied. Influenza is a potentially life-threatening infectious disease, and prevention via vaccination is essential to reduce morbidity and mortality. Annual vaccinations have been proven beneficial even in years that the covered strains are a mismatch to circulating viral strains. When influenza does cause illness, the NIs and newly FDA-approved baloxavir marboxil are the drugs of choice. The clinical significance of the median time to reduction in symptoms compared with the placebo has been questioned with each of these antivirals. However, a reduction in severity and time of symptoms are potentially life-saving. Baloxavir marboxil is a single-dose antiviral, which shows promise. Data show similar results to oseltamivir regarding median time to reduction in symptoms in both otherwise healthy individuals and those at high risk of complications, but a statis- tically significant reduction in viral shedding compared with either oseltamivir or the placebo was identified. The clinical significance in this reduction is unknown, but it has the potential to reduce spreading of the disease, and future studies will need to be conducted to elucidate this effect. Finally, close monitoring of antiviral resistance is imperative to ensure proper treatment of patients with influenza. Rebecca A. Jayakumar, PharmD, is an assistant professor of pharmacy practice at Roseman University College of Pharmacy in Henderson, Nevada, and maintains an infectious disease clinical site at Valley Hospital Medical Center in Las Vegas, Nevada. Brankston G, Gitterman L, Hirji Z, Lemieux C, Gardam M. Transmission of influenza A in human beings. Lancet Infect Dis. 2007;7(4):257-265. Cox NJ, Subbarao K. Influenza. Lancet. 1999;354(9186):1277-1282. Nicholson KG. Clinical features of influenza. Semin Respir Infect.1992;7(1):26-37. Dawood FS, Jain S, Finelli L, et al; Novel Swine-Origin Influenza A (H1N1) Virus Investigation Team. Emergence of a novel swine-origin influenza A (H1N1) virus in humans. N Engl J Med. 2009;360(25):2605-2615. doi: 10.1056/ NEJMoa0903810. Ho YC, Wang JL, Wang JT, et al. Prognostic factors for fatal adult influenza pneumonia. J Infect. 2009;58(6):439-445. doi: 10.1016/j.jinf.2009.03.007. Bautista E, Chotpitayasunondh T, Gao Z, et al; Writing Committee of the WHO Consultation on Clinical Aspects of Pandemic (H1N1) 2009 Influenza. Clinical aspects of pandemic 2009 influenza A (H1N1) virus infection. N Engl J Med. 2010;362(18):1708-1719. doi: 10.1056/NEJMra1000449. Fiore AE, Uyeki TM, Broder K, et al; Centers for Disease Control and Prevention (CDC). Prevention and control of influenza with vaccines: recommendations of the Advisory Committee on Immunization Practices (ACIP), 2010 [erratum in MMWR Recomm Rep. 2010;59(31):993] [erratum in MMWR Recomm Rep. 10;59(35):1147]. MMWR Recomm Rep. 2010;59(No. RR-8):1-62. Thompson MG, Pierse N, Sue Huang Q, et al; SHIVERS investigation team. Influenza vaccine effectiveness in preventing influenza-associated intensive care admissions and attenuating severe disease among adults in New Zeeland 2012- 2015. Vaccine. 2018;36(39):5916-5925. doi: 10.1016/j.vaccine. 2018.07.028. Udell JA, Zawi R, Bhatt DL et al. Association between influenza vaccination and cardiovascular outcomes in high risk patients: a meta-analysis. JAMA. 2013;310(16): 1711-1720. doi: 10.1001/jama.2013.279206. Colquhoun AJ, Nicholson KG, Botha JL, Raymond NT. Effectiveness of influenza vaccine in reducing hospital admission in people with diabetes. Epidemiol Infect. 1997;119(3):335-341. CDC. Influenza antiviral medications: summary for clinicians. CDC website. cdc.gov/flu/professionals/antivirals/summary-clinicians.htm. Updated November 28, 2018. Accessed December 12, 2018. Hayden FG, Sugaya N, Hirotsu N, et al; Baloxavir Marboxil Investigators Group. Baloxavir marboxil for uncomplicated influenza in adults and adolescents. N Engl J Med. 2018;379(10):913-923. doi: 10.1056/NEJMoa1716197. Ison MG, Portsmouth S, Yoshida Y, et al. Phase 3 trial of baloxavir in high risk influenza patients (CAPSTONE-2 Study). Presented at: IDWeek 2018; October 3-7, 2018; San Francisco, CA. Abstract LB16. idsa.confex.com/ idsa/2018/webprogram/Paper74204.html.